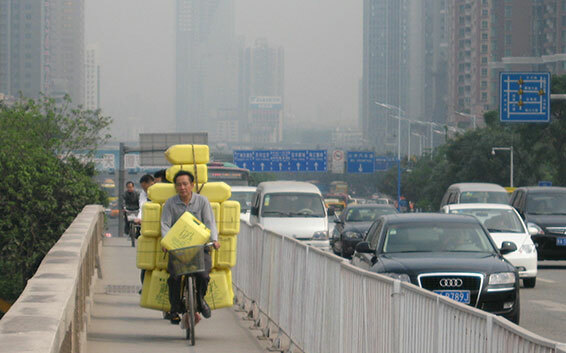 ANN ARBOR—Income inequality has been rising rapidly in China and now surpasses that of the U.S. by a large margin, University of Michigan researchers say. That is the key finding of their study based on newly available survey data collected by several Chinese universities. “Income inequality in today’s China is among the highest in the world, especially in comparison to countries with comparable or higher standards of living,” said Yu Xie, a U-M sociologist. Xie, a researcher with the U-M Institute for Social Research, is co-author with U-M graduate student Xiang Zhou of an article published online this week in the Proceedings of the National Academy of Sciences. The researchers based their main analyses on data from the China Family Panel Studies, a large-scale survey project conducted by Peking University’s Institute of Social Science Survey. The project represents about 95 percent of the Chinese population in 25 provinces in mainland China. The work was started in 2010 in collaboration with U-M’s ISR (a formal partnership between the two institutes was established in 2005, with an emphasis on quantitative social science methods). Xie and Zhou also used data from six other surveys conducted by Chinese university-affiliated survey organizations using internationally accepted scientific sampling methods. “Unfortunately, for a variety of practical and political reasons, government statistics have not been a reliable source of information on income inequality in today’s China,” Xie said. The U-M researchers calculated an internationally accepted measure of income inequality, the Gini coefficient, and compared it to earlier estimates for China and to coefficients for other nations around the world. A Gini coefficient of zero expresses perfect equality, with everyone having the same income. A Gini coefficient of one expresses maximum inequality, with only one person having all the income. The U-M study found that the Gini coefficient for family income in China is now around 0.55 compared to 0.45 in the U.S. In 1980, China’s Gini coefficient was 0.30. In 2012, the Chinese government refused to release the country’s Gini coefficient. Generally, when the coefficient reaches 0.5, it indicates that the gap between rich and poor is severe. “Ordinary persons in China know about this increase, as they have personally experienced it in their own lives,” Xie said. “Although ordinary Chinese people seem to tolerate the high inequality, they also recognize it as a social problem that needs to be addressed. According to Xie and Zhou, the rise of income inequality in China has coincided with the country’s rapid economic development since 1978. They identify the large regional variation in economic activity and the large income gap between rural and urban residents as the main forces responsible for widening the gap. “The rapid rise in income inequality in China can be partly attributed to long-standing government development policies that effectively favor urban residents over rural residents and favor coastal, more developed regions over inland, less developed regions,” Zhou said. As a result, they say, changes in government policies that would reduce rural-urban and regional disparities could have a major impact on reducing income inequality. The research was funded by the Natural Science Foundation of China, Peking University, and the ISR Population Studies Center, which receives core support from the National Institute of Child Health and Human Development.